In choosing Alfa Laval PureBallast 3, you choose more than the leading ballast water treatment technology. You choose a supplier with total solutions, including the skills, resources and well-developed service offering to support your needs – today and tomorrow. British Antarctic Survey (BAS) operates in some of the world’s harshest and most remote environments. When installing Alfa Laval systems on its new research vessel, the organization sent crew members for in-depth training at Alfa Laval training centres. PureBallast 3 is designed for ease of use so crews can quickly learn how to operate and maintain the system. However, ballast water treatment is still a relatively new application and a training course can ensure the crew runs the system with low operational cost and in a way that maximizes the lifetime of the system. Investing in PureBallast trainings means the crew attains competence about the application area and about how to best operate your PureBallast system. Our trainings are available on board your vessel, at our training facilities around the world and digitally. This annual package includes everything you need to verify your system is functioning according to type approval. Calibration - Ensure all sensors and transmitters are communicating correct values to the control system. Alfa Laval is well prepared for the technical and logistical challenges of retrofitting a vessel for ballast water treatment. On most vessels there is no existing space or consideration for ballast water treatment. 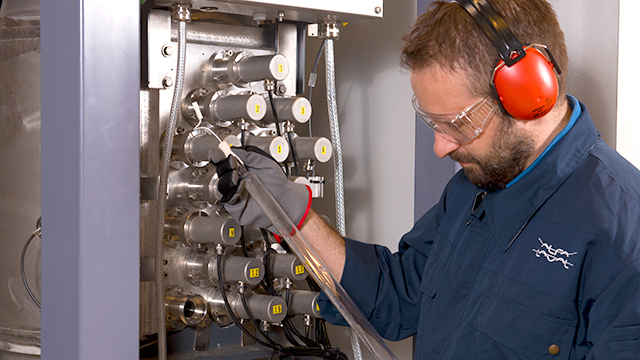 The compactness and flexibility of PureBallast 3 Compact Flex will simplify a retrofit, but Alfa Laval’s hands-on knowledge and proven working procedures are even more important. Alfa Laval has worked with retrofit installations for a decade. Our capabilities, accumulated knowledge and flexible project management make us the most qualified supplier for your retrofit needs. We customize each project to meet your requirements, even offering budgeting assistance and financing options. Retrofits involve partnerships, often at a global level. We can work with your engineering department and chosen yard, or we can secure competencies from our own network for engineering support, 3D laser scanning, class approval and more. Likewise, we can meet your existing docking schedule or arrange for installation during your voyage. As a global organization with strong logistics, we can even move with your project if your trading routes change prior to docking. Our presence and capabilities worldwide ensure a smooth and successful project, even when major changes occur. PureBallast 3 is a wise choice of compliance technology, backed by reliable service choices to secure its lasting performance. Alfa Laval is not only the most experienced supplier of ballast water treatment systems, but also a true marine supplier with a global service network and a century-long track record. All that expertise is part of a PureBallast system – and the comprehensive services that support it. Ensure proper installation according to best practices and classification society specifications. Ensure all sensors and transmitters are communicating correct values to the control system. Ensure your system is true to its type approval through system updates and careful evaluation of all functions. 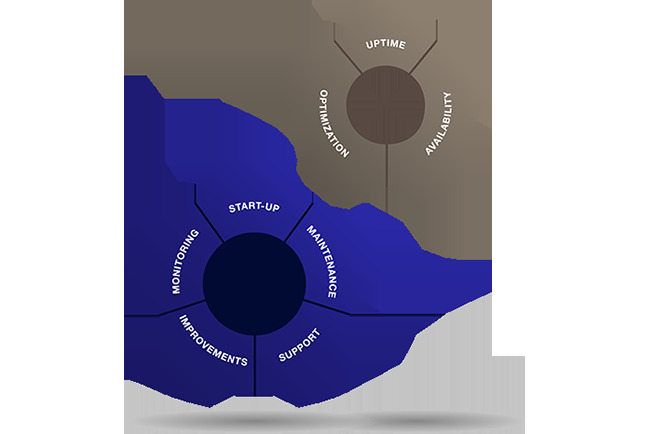 Restore performance and avoid potential damage at start-up after a long period of system inactivity. These services and others can be used on their own, or combined in a tailor-made Alfa Laval Performance Agreement. With an Alfa Laval Performance Agreement, you experience true security while knowing your service costs in advance. The Alfa Laval 360° Service Portfolio offers many services to keep your PureBallast system working at its best. While they can be used individually, you get most value by combining them in a tailor-made Alfa Laval Performance Agreement. 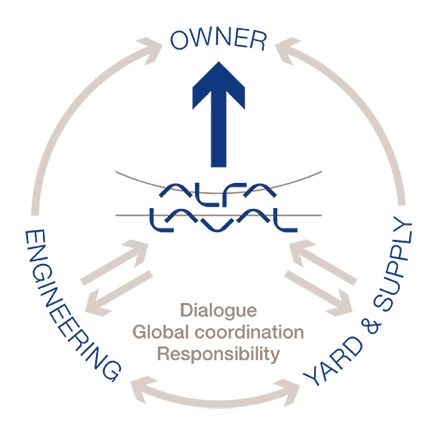 Alfa Laval has an extensive global service network dedicated to helping you get the most from PureBallast and other equipment. Alfa Laval is nearby, 24/7 and wherever you sail. In key marine harbours, by phone, online or on board, our service experts help you achieve maximum uptime and the highest degree of optimization. Our global service network keeps you competitive by minimizing costs and maximizing the return on your equipment investment. By taking advantage of our skills and support, you can rely on PureBallast for cost-effective compliance throughout your vessel’s lifetime. Our service team’s knowledge is drawn from a century of marine experience – including more than a decade of experience in ballast water treatment. You benefit from a long tradition of finding solutions, and from best practices identified worldwide. Besides securing parts and performing maintenance, our service engineers can train your crew, troubleshoot complex issues or evaluate your equipment and make expert recommendations. In port or at sea, their constant aim is to bring you peace of mind.